The secret to great veggie smoothies is balance — sweet, somewhat mild vegetables like carrots, cucumber, or spinach are balanced by a range of fruits like bananas, pears, and oranges. For both of these veggie wonders, there is texture and sweetness to achieve a balanced, absolutely kid-friendly sip. 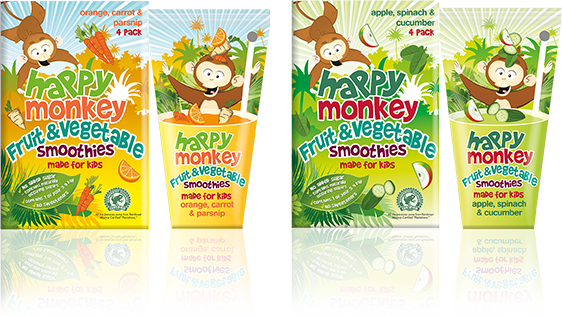 Happy Monkey Fruit & Vegetable Smoothies are the perfect way for children to get one of their 5 a day. Sold in packs of four they’re designed to fit snugly inside your child’s school lunchbox and be taken on days out.